The global leading maker of portable storage products, WD has debuted its new USB 2.0 powered My Passport AV external hard drive, which is optimized for media (movie, music and photo) storage and smooth playback, working seamlessly with Sony Handycam’s new Direct Copy feature that allows Handycam users to offload and archive their HD video directly to WD My Passport AV without the need of a PC. 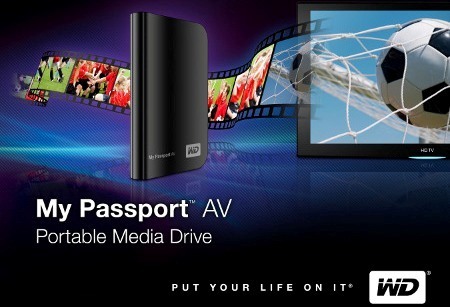 According to Western Digital, My Passport AV portable media drive can be connected to a number of game consoles (Xbox 360 and PS3), camcorders, Blu-ray Disc players, TVs, DVRs and WD TV media players for streaming media to your big screen TV. Check the compatibility information of WD My Passport AV from WD’s official site. The new compact, lightweight WD My Passport AV portable multimedia drive which measures 0.60 x 5.0 x 3.10 inches and weights in at 0.40 pounds is now available at www.shopwd.com and select retailers for around $110 (320GB storage capacity).